The Internet Movie Database suddenly includes a listing for a brand new, probably fake, Fallout sequel. These Fallout hoaxes are getting a little old, but every time a new one pops up, I automatically get excited. Though, to be safe, I'm just going to assume this new rumor is completely false, and you should too. Yesterday, a Reddit user, whose account has been suspiciously deleted, posted a link to an IMDB listing for a game called Fallout: Shadows of Boston. The cast list includes Fallout alums like Ron Pearlman and Paul Eiding, but introduces a couple of new actors like Charles Martinet, who's been the voice of Mario since 1991. As far as I can tell, whoever created the entry randomly selected a series of cast members who have an affiliation with the Fallout series or a general connection to the video game industry. Unfortunately, that's not how Bethesda has made casting decisions in the past. Most of the characters in New Vegas were voiced by well-known actors like Matthew Perry, Kris Kristofferson, and Zachary Levi. 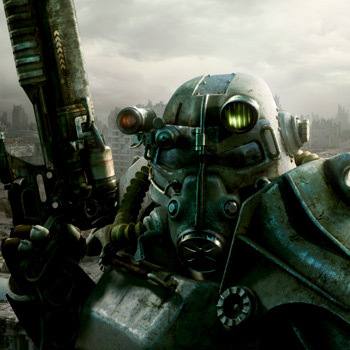 And Fallout 3's cast included Liam Neeson and Malcolm McDowell. So, without some actual star power, Shadows of Boston has a fictitious ring. Adding a new record to IMDb isn't exactly difficult. And given Fallout's recent history of hoaxes, I'm throwing this rumor into the bogus bin with the others. Plus, can we all agree that Shadows of Boston would be the lamest title in history?